We are so thankful for our relationship with you. Each ministry Kingdom Global sponsors and empowers is precious to us. We are are grateful for you and want to connect and grow men, women and missions. Please consider taking a LOVE offering for Kingdom Global Ministries in your congregation on that day, December 3. In your business, determine what love gift you can send on that day. Send the amount that you receive, large or small. What matters is that we all participate and unite. You can call it KGM LOVE FEAST OFFERING. Your LOVE offering to KGM will say thank you to Larry and Devi and KGM for your invested relationship. Your participation will create a united effort to launch 2018 new global initiatives strong. Reach Latino communities by publishing all books in Spanish and conducting bi/lingual men’s and women’s conferences in Spanish. Larry will travel with a companion to several new nations by request of those national leaders. All of these global trips must be self-sponsored. Staff needs to be increased by at least two full time people. An evangelism strategy to reach Portugal is also in the plan, working with Portugal and Brazilian pastors to conduct family conferences in Catholic cathedrals. We did not set a monetary goal but rather, we want to set a budget based on what you help to provide. Our higher goal is to unite us in a tangible honor first to the Lord, for what He has done, and to the apostolic ministry of KGM; past, present, and future. As you know, we are a network of leaders who serve the Church, the marketplace, and in missionary ministries. We are diverse in our gifts, ministries, and people. We are expanding. The pace of leaders contacting Larry and KGM from both the U.S. and globally is increasing. The global impact of the Titus’s mantle has an amazing demand. With your help, Larry will not have to say no. 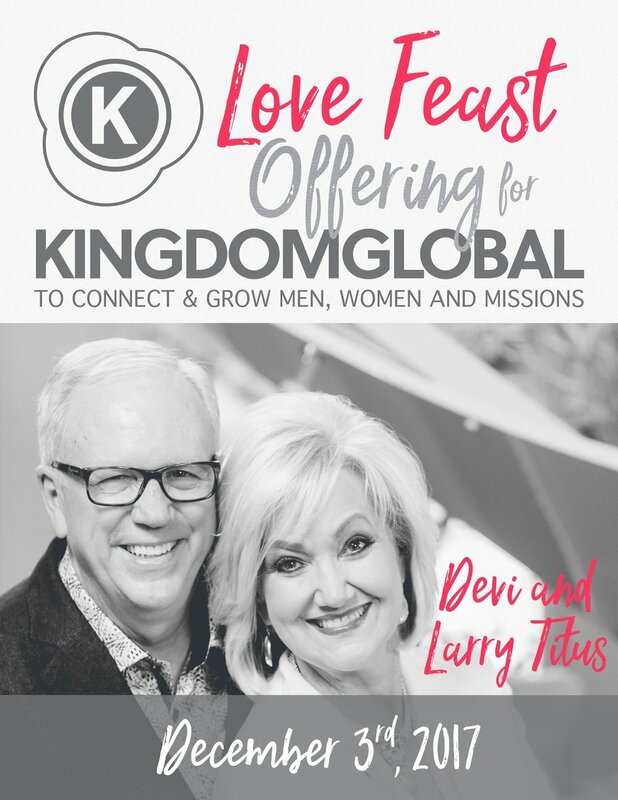 If you would like to join us for the Love Feast Offering, please email us via info@kingdomglobal.com.